Note: See the linked page (highlighted at the top of this page) for more information about the ancestral name, its modern descendents, and the plants it denotes. 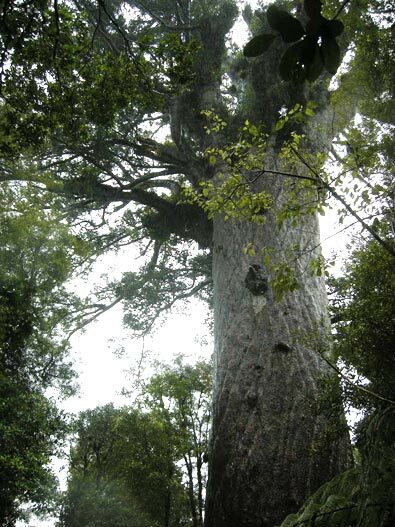 The word "Kauri" is derived from a descriptive combination originally meaning "black tree". It originated around the time Polynesian voyagers set out from Samoa to explore the Eastern Pacific. The kauri is an iconic tree, historically and culturally of great importance to New Zealanders. Although intimately associated with the far north of New Zealand, its natural range extended to the northern Waikato (as far as the southern edge of the Kawhia harbour) and the Coromandel peninsula. Much of the kauri forest was destroyed by milling in the 19th Century, but significant remnants remain in Northland and the Coromandel. There are smaller remnants in Auckland and the Waikato, including an important stand in the Hakarimata Ranges a few kilometres from our garden, where two giant trees which escaped the loggers' saws and axes have over the last century produced a regenerating forest. The kauri itself is part of New Zealand's heritage from the continent of Gondwanaland; its ancient form was present in the area that eventually split off as Aotearoa over 200 million years ago. The other members of the genus Agathis originated from the New Zealand form, so the kauri is the most ancient member of the genus. It is the only member of the Araucariaceae in the modern New Zealand native flora. The kauri is a very long-lived tree, when it escapes the loggers' axes and adzes: the oldest surviving specimen is Tāne Mahuta, in the Waipoua forest (pictured above), and many surving trees in that forest, the Waitakere and Hunua Ranges in Auckland, and the Coromandel are several centuries old. Recently the kauri has been seriously threatened by a water mould which infects the roots of trees and will eventually kill them. It is spread through infected soil, which may be carried on footware by trampers and tourists. The Ministry of Primary Industries has set up a website with information about the kauri die-back disease, what is being done to stem its advance, and what you can do to help. 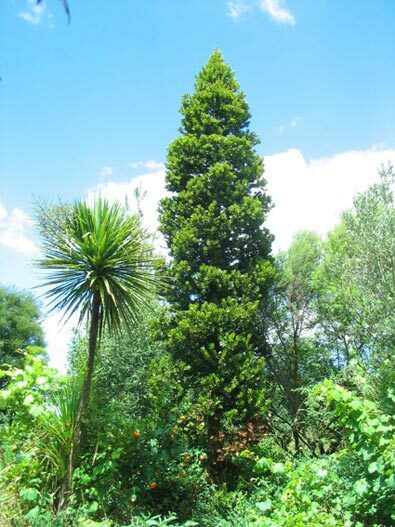 Along with our forty-plus New Zealand kauri, we have a specimen of the Queensland Kauri, Agathis robusta, in the garden, and also two other members of the wider Araucarian family among our exotic plants: the bunyabunya, Araucaria bidwillii, and the Norfolk Island Pine, A. heterophylla. In Maori tradition, the appearance of the kauri's bark links it with the tohorā (or tohoraha), the southern right whale (Balaena australis). The kauri and the whale were friends, but the whale preferred the sea while the kauri wanted to stay on land, so they exchanged skins, which is why the kauri has such a thin, grey skin and so much resin, just as the whale has abundant oil. There was extensive background information in the article on kauri in Te Ara - The Encyclopaedia of New Zealand, along with a brief mention of the link between the kauri and the right whale. Unfortunately, the links to this information have been changed, and the current site was inaccessible when we checked while updating these pages. When we can find URLs that work, we will restore the links to those pages. Excellent sites for information on the botany of the plant (and more photographs) are the University of Hamburg's botanical pages , The University of Auckland Botany Department's website, and the Australian Gymnosperm Database . Just click on any of the links to go to the page of your choice - it will open in a separate tab or window. There are over 40 kauri growing in the garden, most planted in 1997, soon after we moved to Ngaruawahia. You can see at least one (if only the top of it) from anywhere on the upper levels, as it is tall tree which grows relatively rapidly when young, filling out to a massive forest giant after several hundred years. 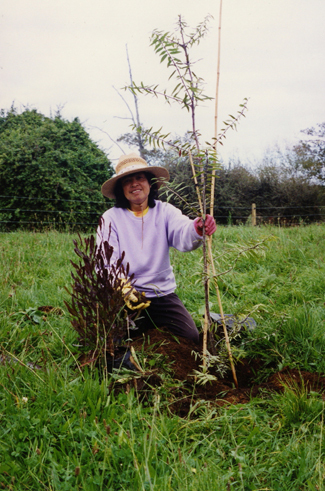 The photograph on the left shows Nena Benton about to plant one of the first as a spindly seedling in 1997. The same tree, 11 years later, can be seen against the skyline in the photograph in the introductory section, above. The photograph on the top left of this page was taken in 2009 from a spot from where, without moving anything but your head, you can see 9 kauri trees, four quite close by and and another 5 in the middle or far distance (if you look carefully, there are 5 of these, a couple a long way off, in the photograph). 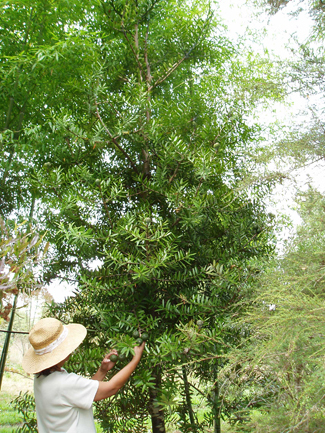 Until January 2008 there were 51 of these trees, but about half a dozen were so stressed by the drought that year that they did not recover. Most of the ones that died were on the lower level, ironically quite close to the river, but in an open location with very little topsoil and thus nothing to hold the moisture for these surface-rooted trees in what was by far the driest January since records were first kept over a hundred years ago. We have had several more droughts since then, but there is now more cover and the remaining trees have survived relatively unscathed. The Kauri in Traditional Maori Poetry and Proverbs . Anā ngā kauri kei Waharakeke. Te Taite Te Tomo says in his note on the last line quoted: "Waiharakeke. A river on the south-eastern shores of the Kawhia Harbour. Five kauri trees grew there which were the most southerly in the country. Here, figurative of the chiefs of the locality." I nga tai whakarewa kauri ki te uru. In the first of these two examples, the kauri is a metaphor for both the deceased chief, and the canoe which will take him back to his ancestors. In the second, the kauri represent fallen chiefs, and the western sea denotes the territory of Te Ati Awa of Taranaki who had killed Papaka te Naeroa, the subject of the lament, and his associates. (Cf. H. M. Mead and N. Groves, 2045, p. 330). Māna e ringiringi te renga waikauri. Puritia tō kauri hei ō matenga mō! He aha i kīa ai ko koe hai tōtara haere wā, ko au hai kauri tū i te wao? 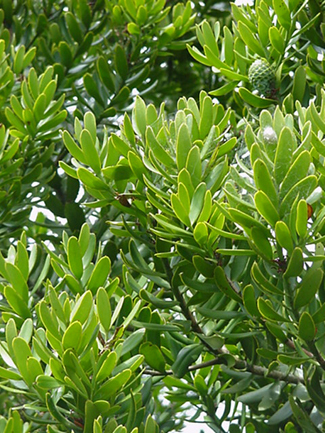 The tōtara (Podocarpus totara), more abundant, durable, excellent for carving and relatively easier to fell, was widely used for making canoes, hence its symbolizing mobility as against the immovable and therefore static kauri. Tērā e titiro ka ngaro Rotorua i te kauri. The Kauri in Te Paipera Tapu . The kauri also features prominently in the Māori translation of the Bible, completed in the 1860s and revised several times since. The tree makes its appearance 20 times, spread over ten books in the Old Testament, generally where the English translations mostly use "fir" (King James Version) or "cedar" (Revised Standard Version, and others); however in some verses its English translation may be "pine" in either version, or "fir" in the RSV or both. In each of these cases it is a translation of the same Hebrew word, berosh. The reason for the inconsistency is that berosh is a "taxon", that is, a word that groups together several entities sharing some common characteristics -- in this case, three species of stately evergreen conifers growing in Israel and Lebanon. These are the evergreen cypress, Cupressus sempervirens,, native to both regions, and the eastern savin (Juniperus excelsa), native to Lebanon, both members of the Cypress family (Cupressaceae), along with the Cicilican fir (Abies cilicica), a species of pine (Pinaceae), which grows in Northern Lebanon but is not found naturally in Israel. All are tall, slim, impressive trees, reminiscent of the kauri, both in form (from a distance -- the leaf structures are very different) and in longevity -- the Cypress for example is known to live for several millennia. 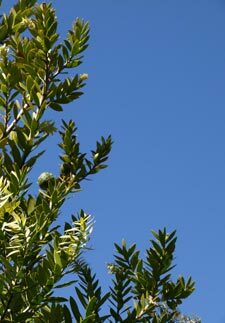 The English names are Northern European similes for the Middle-Eastern species, just as the kauri is a distantly related tree recognizable in Aotearoa which shares many qualities with its Mediterranean counterparts. Interestingly, the translators of the Bible into Samoan took a different approach in their handling of berosh, using a single word, as with their colleagues in Aotearoa, but simply adapting the Hebrew word to Samoan phonology, as perosi, rather than translating it to a local equivalent. Na ka tono tangata atu a Hirama ki a Horomona , hei mea, kua rongo atu ahau i te kupu i tukua mai nei e koe ki ahau: ka mahia katoatia e ahau tau e hiahia ana, ara nga rakau, te hita me te kauri. [And Hiram sent to Solomon, saying, I have considered the things which thou sentest to me for: and I will do all thy desire concerning timber of cedar, and concerning timber of fir. 1 Nga Kingi / 1 Kings 5:8,10. Hita, the Maori adaptation of the English word "cedar" does refer to the famous cedars of Lebanon, Cedrus libani (Pinaceae). Since Solomon would have had little reason to order cypresses from Hiram -- he had plenty much closer to home -- the "cypress" in the English translation is probably the Cilician fir, Abies cilicia. ... E Taira, kua mea na koe, Ko ahau te mea ataahua rawa. Kei waenga moana ou rohe, oti rawa koe e whakaataahua e ou kaihanga. [O Tyrus, thou hast said, I am of perfect beauty. "Kauri" and "Fir" refer to the savin, Juniperus excelsa, which still grows in abundance on Mount Senir (Hermon). Whakatuwheratia ou kuwaha, e Repanona, kia kai ai te ahi i ou hita. [Open thy doors, O Lebanon, that the fire may devour thy cedars. References and further reading: See links in the introductory section to this page; also for information on the associations of the kauri with Gondwana, see the book by George Gibbs, and for the medicinal uses of the Kauri, Murdoch Riley's Herbal, both referenced in the bibliography. Information about the Biblical plants mentioned can be found in the book by Michael Zohary (details above), pp. 106-7; there are also good Wikipedia articles on Cupressus sempervirens, Juniperus excelsa and Abies cicilica. Biblical Quotations are from Te Paipera Tapu (PT), London: British and Foreign Bible Society, 1958; The Holy Bible: Revised Standard Version ... (RSV), New York: Oxford University Press, 1962; and The Holy Bible: Authorized King James Version (KJV), Oxford: Oxford University Press, 1998. 10 year old kauri starting to produce cones. Another kauri ten years after planting.